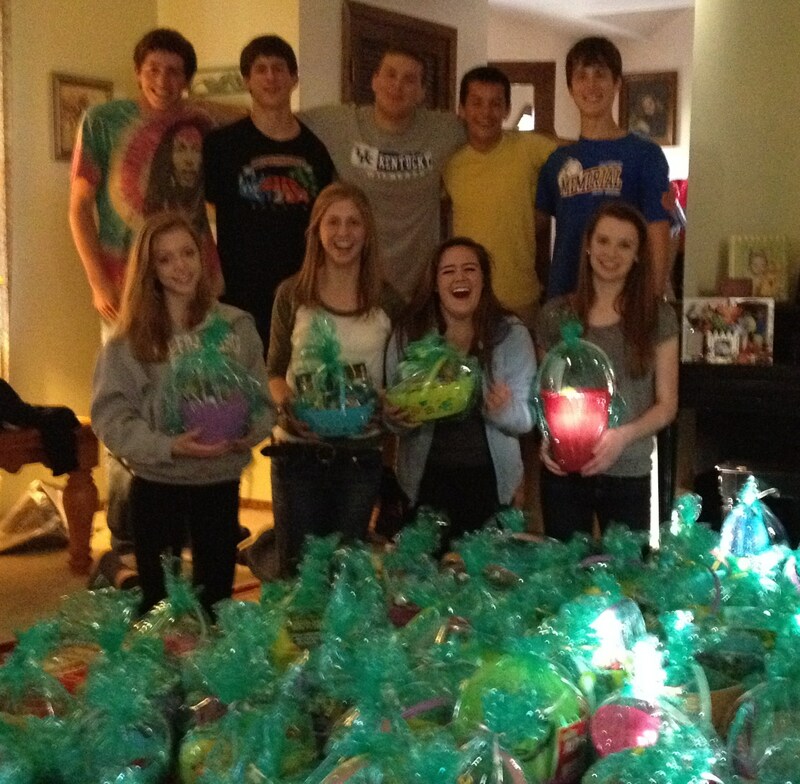 CMH students help make Easter Baskets for kids at The Joy House. We are blessed to send our boys to great Catholic schools. We love that God is present there, and can be discussed, openly in our schools. We feel his presence throughout the hallways, we see the cross hanging near the front office, we hear the Our Father prayer every morning and say a prayer to end the day. This morning was a Chapel mass, Tony had a reading. Joey also reads at their weekly mass. With Easter season upon us, it’s important to me that we are reminded of God’s love. There is an overwhelming need for service in our schools, and communities. There are so many needs out there and there are so many ways we can help. I believe that people get overwhelmed by the enormity of the problems, homelessness, hunger, education, drug abuse, the list goes on, and it’s in all of our communities. It’s easy to think, how can I make a difference? How can one person make a difference. The good news is that one person can make a huge difference. For our family it might be with diabetes education, or gathering friends to help make Easter Baskets for homeless children, or collecting toys for kids at Christmastime. It could also mean dropping off a can good at the local food shelter. One can of corn adds to a meal for a family. I wish that I could pray away the homeless problem our country has, or the drug problem, or the abuse problem! I can’t, but I do pray for God to use me as an instrument, show me how I can make a difference, if only to one person, it’s worth rejoicing. It’s time for me to start bothering all my friends for Easter Basket goodies, we deliver them to the children that live in a homeless shelter. Once I have the goodies, I call on my sons’ friends, and they make magic happen! Last year we were blessed to deliver over 200 baskets to The Joy House, a women’s shelter in Milwaukee. There aren’t 200 kids living there, but along with the Cross Trainer’s Academy and tutoring programs they offer, we brought a smile and a little sweetness to those kids lives. All I do is facilitate! God gave me GREAT friends that make all my crazy ideas possible!!! One person at a time, dropping off a bag of candy, makes this possible. If you have an idea to help a certain group, share it with a friend, or your clergy, maybe there are people out there looking for a way to help, but don’t have the ideas! For instance, a family at school heard about our Baskets, they own a law firm, he told his employees about our mission, which turned into them making us about 25 beautiful Easter Baskets, for the 5th year now! His employees had wanted to do something to help the community, they just needed an idea. Last night we celebrated at The Salvation Army Youth Awards. My son’s school, Catholic Memorial High School, won this years Kettle Challenge, which is a competition among area schools, to raise money through ringing the bell for the Salvation Army, at Christmastime. Our kids raised $3,177 . They started at Thanksgiving and rang the bell through Christmas Eve. We are so proud of them! All it took was a ring leader who continued to add a blurb into the school’s weekly Memo. And some encouragement! The kids did the rest! We can all make a difference, whether it’s by making a child an Easter basket, dropping off a bag of grass to contribute to a basket, or by dropping money into that kettle, or ringing it yourself. Ask God and he will lead you to what you are supposed to do. CMH Kids Raise $3,177 for the Salvation Army Via the Youth Kettle Challenge. They also won 1st place in the competition. 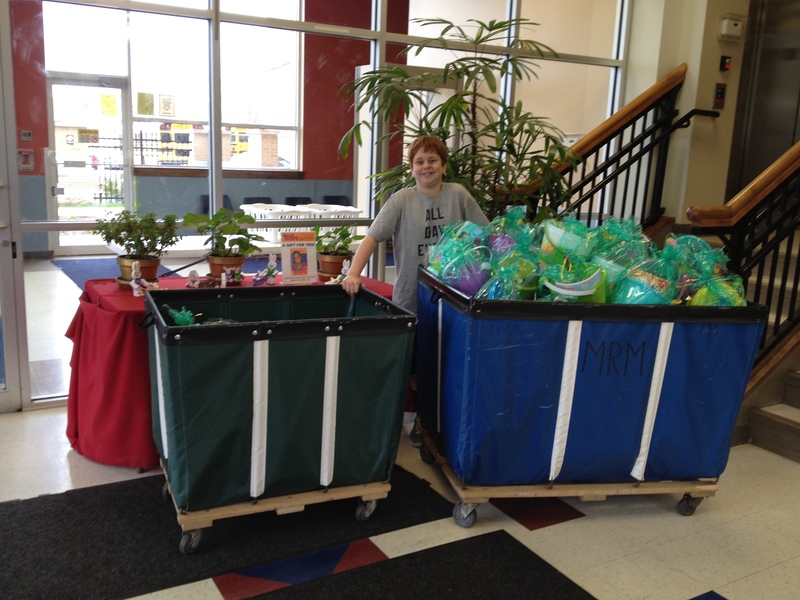 Joey and a whole lot of baskets for the kids. 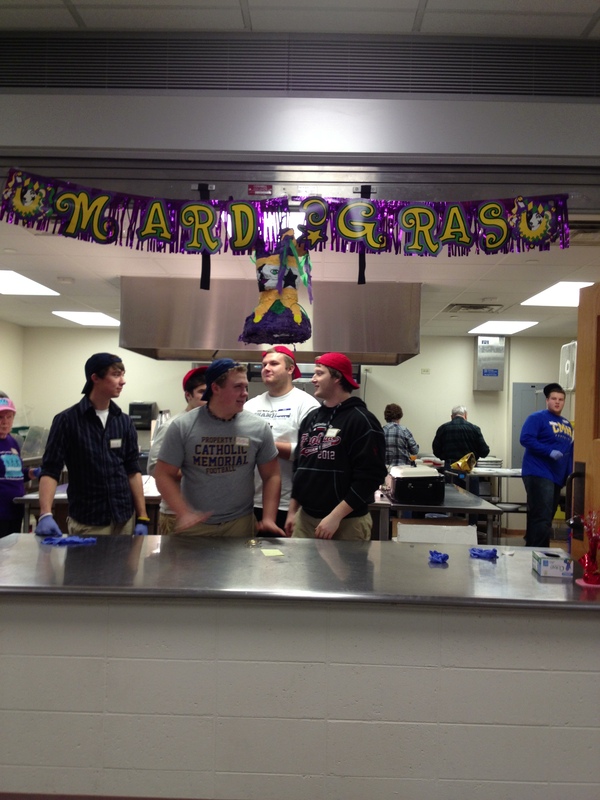 CMH Football Players Volunteer their time at their Football Clergy’s Parish Fish Fry. Next Post Busier than busy now..